Producing 8,667 lm while drawing 100 W, EPL-LED-100W-RT-HDC Class 1 Division 1Â and 2, Class 2 Division 1Â and 2 flood light has powder-coated, copper-free, aluminum alloy body. Heat dissipating design, in conjunction with LED technology, helps fixture achieve 60,000 hr rated lifespan with 80% lumen retention, while multiple LED drivers ensure continued operation in case ofÂ individual driver/LED failure. Solid-state, IP67-ratedÂ design can beÂ mounted to any flat surface. Kemp, Texas – Leading supplier of explosion proof and industrial grade lighting equipment Larson Electronics has announced the release of a 100 watt explosion proof LED flood light that is configured to operate on 125-250 volts DC. The EPL-LED-100W-RT-HDC explosion proof LED flood light fixture from Larson Electronics provides operators with a powerful and energy efficient alternative to traditional hazardous location luminaires. This Class 1 Division 1 & 2, Class 2 Division 1 & 2 explosion proof LED flood light fixture provides 8,667 lumens of high quality light while drawing only 100 watts of power. The copper free aluminum alloy body is powder coated for added durability and aesthetics. A special heat dissipating design in conjunction with LED technology helps this fixture achieve an excellent 60,000 hour rated lifespan with 80% lumen retention. 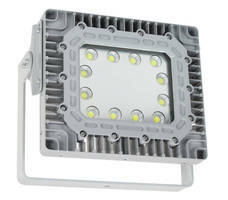 This light features multiple LED drivers which help increase the operational life of the fixture. This LED fixture contains eight individual LED boards configured in a series of banks. Each bank contains two LED boards with an individual driver. In the event of a driver failure, only one bank of LEDs will be affected while the other banks will continue to operate. In the event that of an LED failure, the mating LED will continue to operate. This explosion proof LED light fixture is IP67 rated, dust-proof, and protected against high pressure jets and temporary submersion. The solid state design of light emitting diodes provide a more reliable, stable, durable, and energy efficient light source over traditional lighting. This fixture offers an adjustable mounting system that allows the fixture to be mounted to any flat surface including walls and ceilings. This light is universal voltage capable and can be operated with 125-250 volts DC. Larson Electronics carries an extensive line of LED light towers, portable power distribution systems, explosion proof lights for hazardous locations, portable work lights and industrial grade LED area lights. You can view Larson Electronics’ entire line of lighting by visiting them on the web at Larsonelectronics.com. You can also call 1-800-369-6671 to learn more or call 1-214-616-6180 for international inquiries.